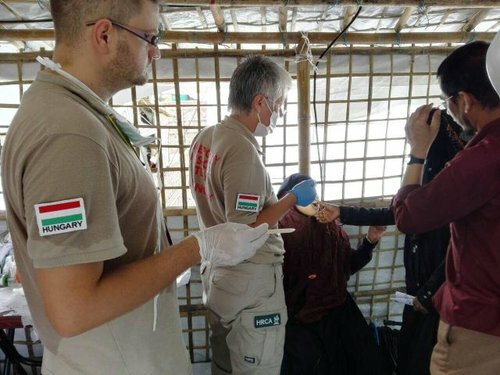 The medical team of the Hungarian Reformed Church Aid (HRCA) left for Bangladesh on 9 July, and 30 hours later, landed at their destination in the city of Cox’s Bazar next to the Rohingyas refugee camp at the border of Myanmar. 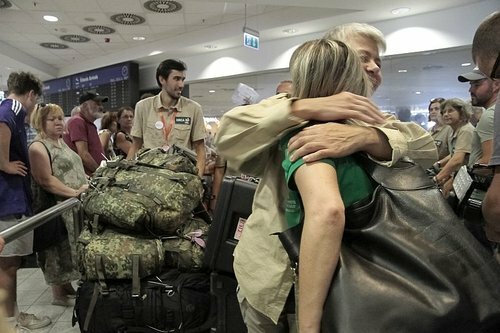 The team returned twelve days later to Budapest, Hungary on 21 July. “During our two-week mission as the HRCA medical team, we did the best we could with our abilities and the opportunities we were given. 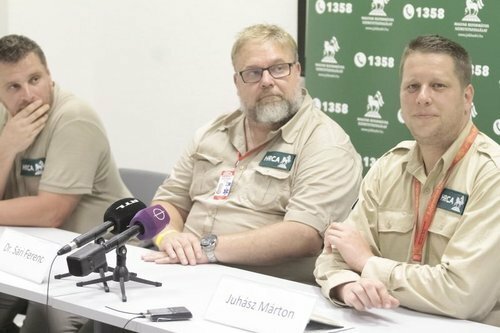 Our mission succeeded with the satisfaction of those we directly aided and the local aid organization,” summarized Márton Juhász, director of the team. The HRCA medical team consisted of Director Márton Juhász, Medical Head Ferenc Sári, Logistics and Security Officer Dániel Osgyán, Physiotherapist Gábor Tóth, Dentist Ildikó Szőke, Family Doctor Valéria Kutnyánszky, Intensive Therapist Gyönygi Juhász, Intensive Nurse Gábor Sebő, Plastic Surgeon Sabina Hegedűs, Midwife Adrienn Kiss, and Artúr Kalatovics as resident. “We want to show people who live outside of the Carpathian Basin that Hungarian Reformed people are helping others, using the HRCA as the extended arm of the church,” quotes Dániel Osgyán. 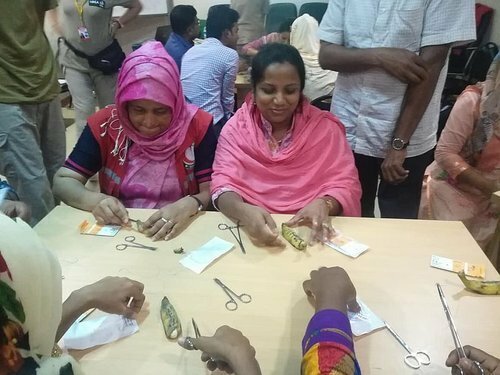 Upon their arrival to Bangladesh, the medical team was asked to hold trainings for local medical professionals working in the field. For the first training session, about 30 medical staff took part, where they focused on treating for contagions, burn or other wounds, and CPR. The second session took place with 15 professionals on the treatment protocol of mass incidents. They also held training on rehabilitation after surgery, “There are a lot of car accidents here, so amputations are common. The local medical staff was able to learn the basics on how to teach patients how to use crutches, as well as ways to make patients sit up or how to turn them,” shared Dániel Osgyán, who served as the logistics and security officer of the team. During training sessions, the HRCA medical team prepared presentations in English, allowing time to share medical experiences, strategize how to apply international principles to their medical treatments, and practice what they learned in interactive activities, such as using a banana to teach how to properly seam wounds. Ferenc Sári shared, “We were constantly improving their techniques, in two hours everyone who attended our training session managed to reach the standard national level.” They were also asked to visit supply stations to help improve procedures. “By teaching and providing suggestions, our work in the refugee camp will have a much bigger effect; because of such improvements, the people will still be able to feel our presence in the long run,” said Ferenc Sári. The team worked in two small groups: half of the team to hold the training sessions for the local medical staff, and the other half provided medical services in the refugee camp of Kutopalong. The team in the refugee camp worked on a variety of tasks, and by integrating the system set by local and other international organizations, they were able to work in multiple locations. Members of the team experienced in general treatment worked together, while those with a specialty joined other groups, like Ildikó Szőke, a dentist, joined a Japanese medical team. Additionally, HRCA medical staff also was flexible in their roles as medical professions. As most local women gave birth at home and a medical assistance was only necessary in case of complications, there was no need for a midwife. However, Adrienn Kiss, instead, helped treat pregnant women, as well as families. Because of the things he witnessed during the mission in Bangladesh, Ferenc Sári shared that he values family more and experiences even more joy in being together, “Through all of the hardships and difficulties the Rohingyas have been through, they greeted us with a smile and shared their life with us.” Márton Juhász, the director of the mission, said, “Sometimes we must move from beyond the comfort of our desks, and visit what we are working for. It is important to see those sparkling eyes in return for a smile – it is important to see that there are people who live in a much different situation than we do.” Even in the greatest of sufferings, values of life, love, and family shine in the lives of the Rohingyas.